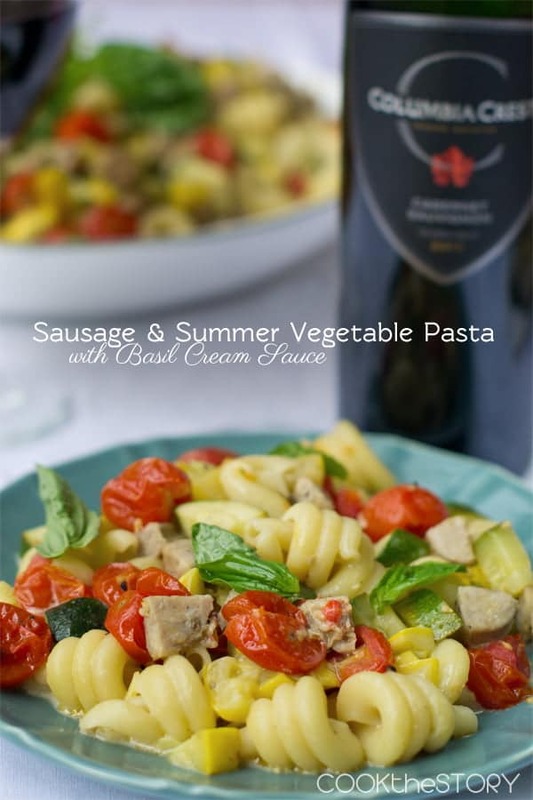 This sausage pasta dinner has zucchini, summer squash and cherry tomatoes in a light basil cream sauce. It’s a hearty but fresh, and definitely easy, summer supper. Did you know that the British use a different word for zucchini than Americans do? They call it courgette. You may have already known this but did you also know that the word courgette and the word zucchini have very similar origins? This favorite green vegetable first made its way to Italy from North America during the 19th century. It was quickly given the Italian name for squash, zucca, but with the diminutive attached, making it zucchini. When it subsequently arrived in France, the French followed the same naming pattern, giving it the French name for squash, courge, and adding the diminutive, making it courgette. I love this parallel language fact almost as much as I love zucchini itself. I’ve been a bit obsessed with zucchini lately, as you may have noticed from this Summer Vegetable Gratin and these Zucchini, Tapenade and Feta Bites. It’s probably my favorite vegetable right now. Which is why when Columbia Crest & al fresco got together and asked me to come up with a sausage and wine pairing I knew I had to add some zucchini. This pasta dinner is very hearty while also being fresh. I used trotolle noodles, a new pasta shape available at my grocery story (don’t you love discovering new noodles? ), which I cooked according to package directions. 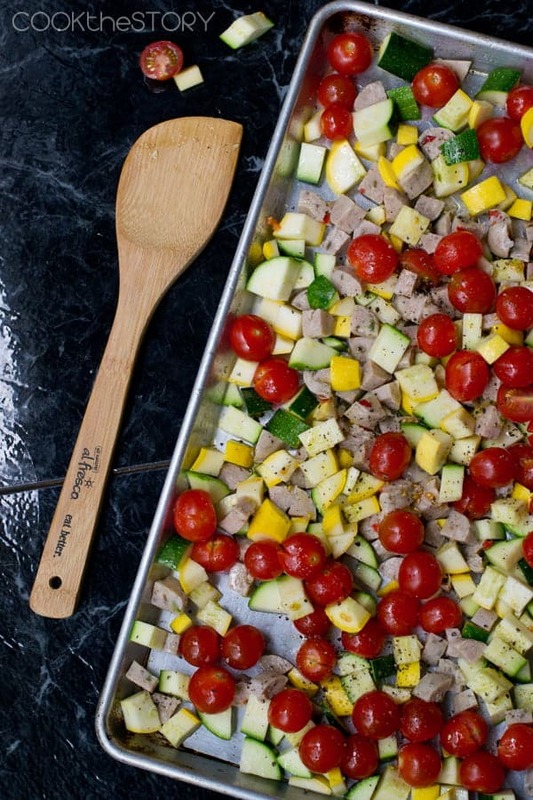 Into the oven went chopped al fresco sweet Italian sausage, chopped zucchini, chopped summer squash and slightly squashed cherry tomatoes. They got a douse of olive oil and salt and pepper first too, of course. While that all cooks, you microwave half-and-half cream mixed with some chopped fresh basil. Let that steep until everything else is ready. Then you strain the cream over the sausage mixture and stir it. And then toss it with pasta. Oh wait, one more step, pour yourself a big glass of Columbia Crest Grand Estates 2011 Cabernet Sauvignon. The creamy buttery flavors and the wine are amazing together. 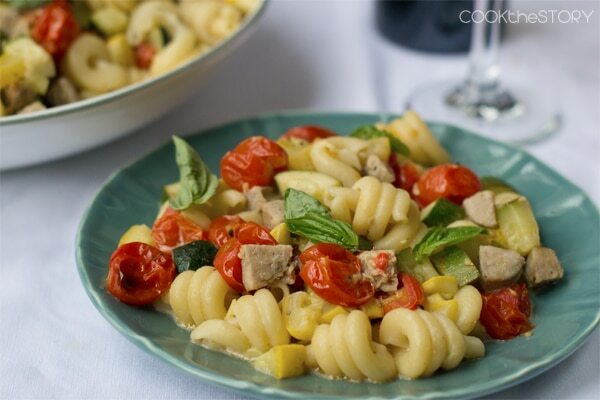 This sausage pasta dinner has zucchini, summer squash and cherry tomatoes in a light basil cream sauce. It's a hearty but fresh, and definitely easy, summer supper. If you can't find trotolle noodles, don't worry. 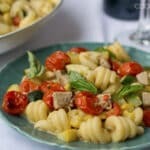 Use another robust pasta shape like rigatoni, cavatappi (corkscrews) or rotini. Preheat oven to 425F. Put water for pasta on to boil. Cut the sausages lengthwise in quarters and then chop into 1/4 inch pieces. 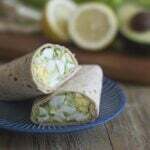 Do the same with the zucchini and the summer squash. Put it all onto a large rimmed baking sheet. Put a few cherry tomatoes on your cutting board. Use the side of a large knife to gently squash them just so that they pop open a bit. They may squirt. Scrape popped tomatoes and their juices onto the pan. Do this with 1/2 of the tomatoes. Put the rest in whole. Drizzle with the olive oil and sprinkle with the salt and pepper. Stir to coat. Bake until everything is hot, veggies are soft and a few tomatoes are starting to brown, about 25 minutes. Meanwhile, cook pasta according to package instructions. Roughly chop the 8 large basil leaves. Put them in a small microwave-safe bowl. Add the cream. Microwave 30 seconds at a time until very hot, about 1 minute total. Add a pinch of salt. Stir. When the sausages and veggies are done, strain the cream overtop. Stir. Toss with the drained pasta. Serve garnished with extra basil leaves. Disclosure: I was free product and coupons from al fresco and 2 bottles of wine. I was not compensated in any other way. All opinions are my own. This was super easy to make and pretty tasty! You’re not kidding when you say the tomatoes will shoot everywhere. I changed the sauce up a bit by adding basil, oregano, salt, pepper, and some parmesan cheese. Instead of microwaving, I heat it up in the pot that I cooked the pasta in to thicken the sauce up a bit more. That sounds great, Tom. Thanks for letting me know! I would make a cold pasta salad with a pinot. I would make a pasta with fresh zucchini, tomatoes and eggplant from the garden and pair it with a lovely glass of Cabernet Sauvignon. I would love to try this dish!! I would make home fires with these sausages chopped up and mixed in. What a wonderful summer dinner – so many of my favorite flavors (and I’m a big al fresco sausage fan, too!). I especially love that all the veggies and the sausage roast together – how quick and easy! Beautiful, beautiful! Summer squash and zucchini are my two favorite summer veggies. 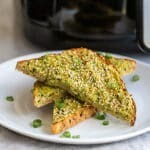 I’ve got to try this dish soon! 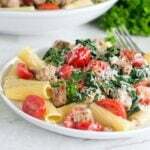 Sausage, carbs and all my favorite veggies WITH a basil cream sauce? I love this and I love you for introducing my face to it. Pinned!